Strong lines and fine finish define the new Odyssey motor yachts. 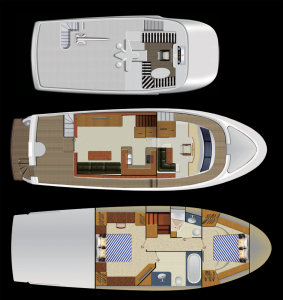 The 52 is designed to take you to sea in comfort and style. 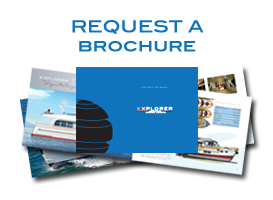 The Explorer Odyssey 52 is built for those who love the wide blue ocean and enjoy the refinements of luxury teak and leather. 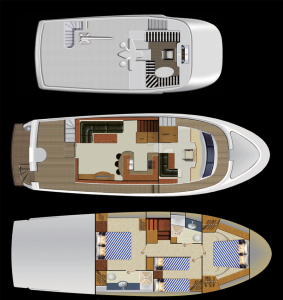 From the dedicated pilot house equipped with a full suite of navigational aids and reverse camber windscreen for perfect night vision, to the luxurious master stateroom, this is a boat that will carry its owners anywhere – in all conditions – in comfort and style. Choose between bespoke two or three cabin layouts; the two cabin version offers a full beam master stateroom and even a bath in the ensuite! Your options for entertaining are varied, from the galley and saloon on one level, an expansive cockpit or the vistas from the flybridge.